All primary producers at the Peterborough Regional Farmers' Market grow or produce 100% of the product they sell. Each vendor is third-party verified. Follow the links under our vendor profile pictures to view certifications and verifications. The Peterborough Regional Farmers' Network also enjoys the great privilege of visiting all vendors at their farms to build a connection and level of trust, which we can then pass onto our customers with utmost confidence. We believe in transparency and providing our community with local food we can all trust. Carolinas Colombia has been growing coffee on their own farm in Colombia and selling roasted coffee in Peterborough since 2012. Winner of Peterborough 2016 Business Excellence Award for Supply Chain. Distance from the market = Admittedly 4,100 km … floating Cartagena to Halifax and by rail to Ontario. But we need coffee right? *Note; we will sometimes offer beverages and beans from non-Colombian farms or from a Colombian Ecocert Organic certified neighbour. These will be clearly labelled when we do. We are beekeepers who aim to connect people with their local ecosystem through education about honeybees and their role in our community. We are planning some exciting community planting initiatives, to create pollinator friendly spaces within the Ptbo/Kawartha Lakes. We run beekeeping seminars at our farm, offer honey extraction services, 1 on 1 sessions in the bee yard, we also produce honey, pollen and beeswax products. Products: Natural Honey (Basswood, Clover, Wildflower, Wetlands, Goldenrod, Buckwheat), Infused Honey (Lemon Ginger, Sweet Heat, Honey Chai, Chocolate and Maple), Creamed Honey (Plain, Cinnamon, Orange Chocolate), Beeswax Food Wraps, Beeswax Candles, Beeswax Lip Balm. 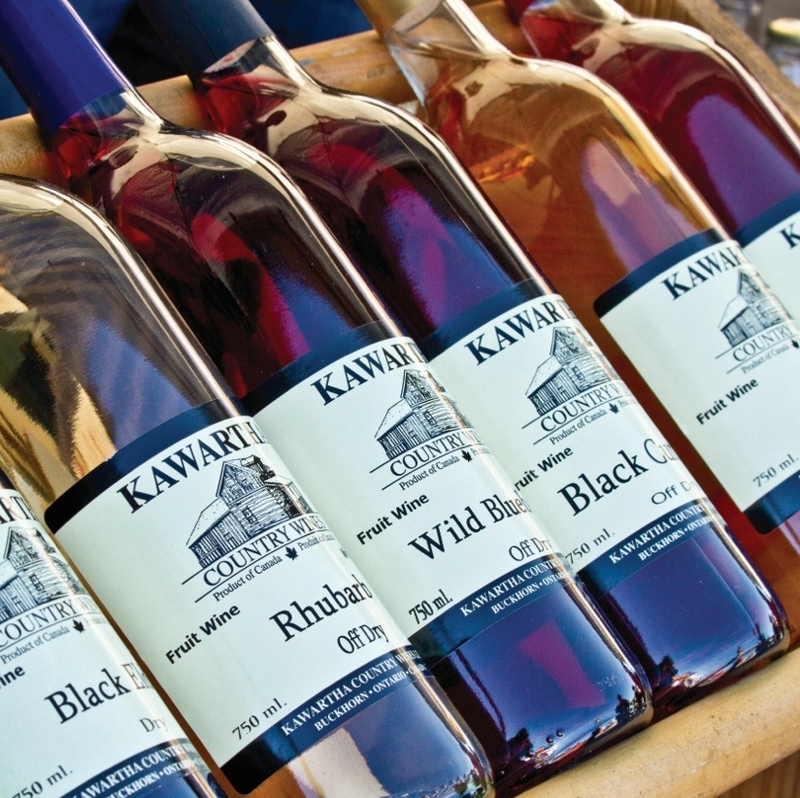 Kawartha Counrty Wines is the first and only winery in the Kawarthas. We specialize in award winning fruit wines, most of which are sourced locally, all of which are grown in Ontario. We also make a large number of fruit vinegars, jams and jellies. Our winery in Buckhorn is open 7 days a week and features a complimentary sampling bar. Products: fruit wines, fruit vinegars and jams. We are a 5th generation Maple Syrup producing family making pure maple products on our 300 acre property, on the North Shore of Rice Lake in Peterborough County. We currently have about 1000 taps, with many more available trees in the sugar bush to expand our business in the future. Most of our sap is collected using gravity fed pipelines, with only a small portion still being collected using buckets. We boil our sap using the wood cut from the farm on a stainless steel, wood fired evaporator. Our sales of maple syrup, sugar and butter consist of our loyal customer base at the farm gate and at a few local events within the community of Asphodel Norwood. Custom sawmilling is also available on the farm. Products: Maple syrup, butter and sugar (leaf/other moulds and granulated). Maple product-filled gift baskets by request/preorder only. Forest products of live edge boards, interesting wood burls, etc., when available. Forest/log grown shitake mushrooms - but very limited availability of these. The honey bees from Otonabee Apiary pollinate local flora and gather nectar from the fields, forests and wetlands east of Peterborough, providing delicious & flavourful honeys. All of our honey is 'As the Bee Makes It!’ , raw & unpasteurized, and is bottled as a liquid, creamed or in the comb. We offer a few prepared products, for the discerning palette - honey butter, infusions and honey lemonade, as well we have a selection of handmade candles made from our beeswax. Please come visit us at the Market. We love questions and we love to answer them!